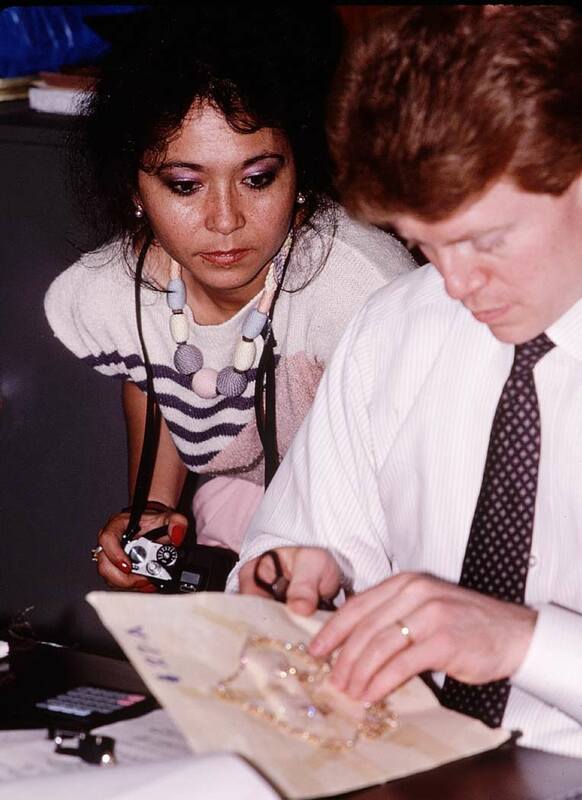 The jewelry of Imelda Marcos collection called Roumeloites, photographed in 1988 for PCGG. On the night of February 25, 1986, President Ferdinand Marcos fled the Philippines with his wife Imelda Marcos for the United States. They left behind them controversy which rages to this day. It was at this time I suppose, the government felt that documents found left behind at Malacañang were the real treasures. appraisers from Christie's Auction house. Eleven days later, after the Marcos’ departure from Manila, on March 9, 1986 a certain Mr. Demetriou Roumeliotes (hence the name of the collection, much to the chargin of that family) a Greek national, boarding a flight to Hong Kong was detained by Philippines Customs officials. 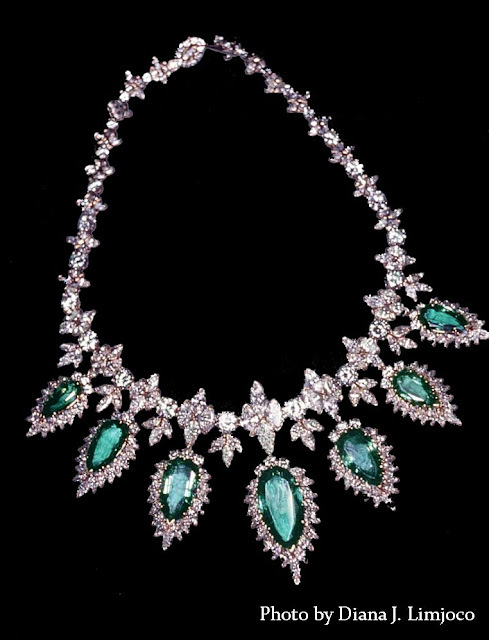 They were following up an anonymous tip, and said passenger was found to be carrying 60 pieces of expensive jewelry which was addressed to Imelda Marcos. 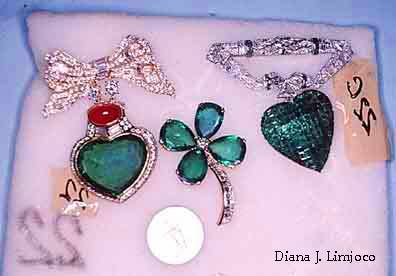 These were confiscated and taken to the Central Bank of the Philippines for safekeeping and itemization. 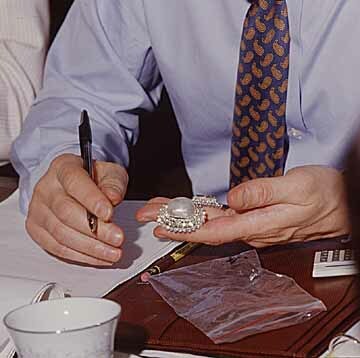 Appraisers from Christie’s, were brought in to evaluate the 60 pieces of jewelry. 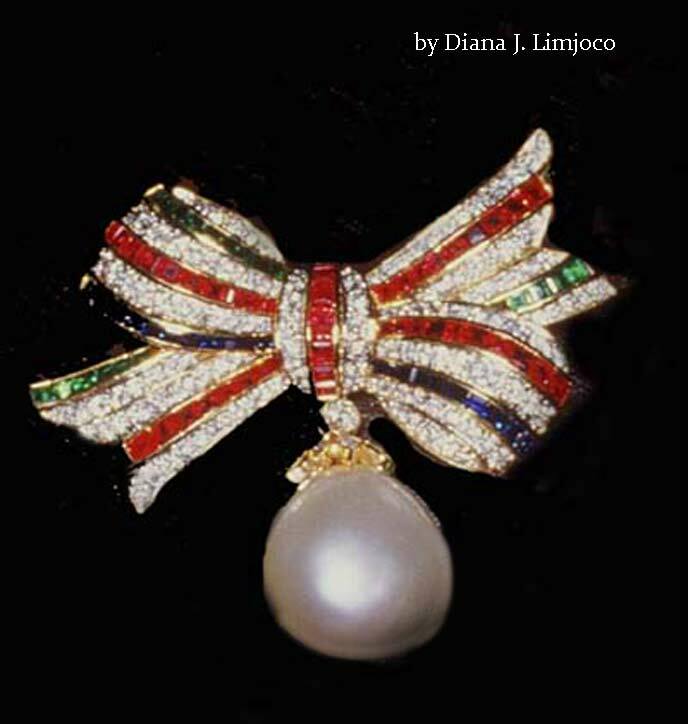 There are two other collections of jewelry; some were actually removed from the Marcos’ private chambers when they fled Malacañang Palace in 1986, some were removed from the plane carrying them into Honolulu. I was asked by PCGG in 1988 to photograph and document the jewels, as an act of transparency. There was also a PCGG photographer present, and 2 VP's from Christie's Auction house, Russel Fogarty, who founded the firm of Kazanjian & Fogarty, Inc. in 1991 to buy and sell important jewels, gemstones and designer creations on behalf of private clients worldwide and François Curiel, President and Chairman of Christie's Asia Pacific. We were each given a list from BOC, containing 60 items, some of which were loose stones wrapped in paper. "It was announced today in the news that PCGG is intending to display the entire collection of jewels seized to attact tourists, after which they will be auctioned." Original article here. In the course of 26 years I have heard this many times. 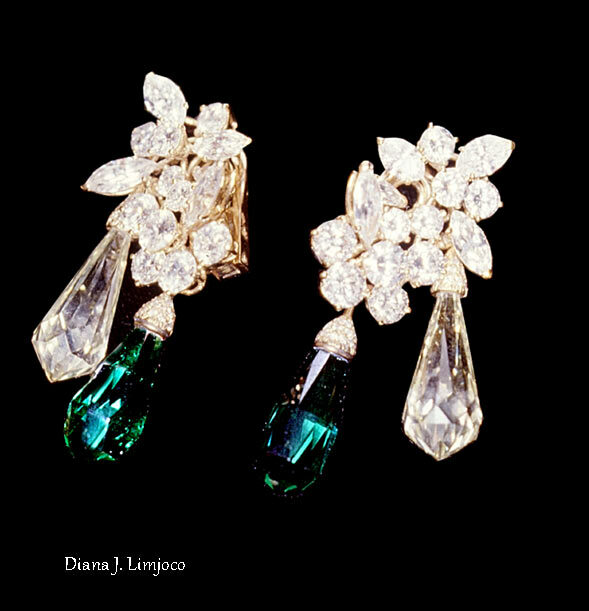 Here are some of the jewels from the Roumeliotes Collection. 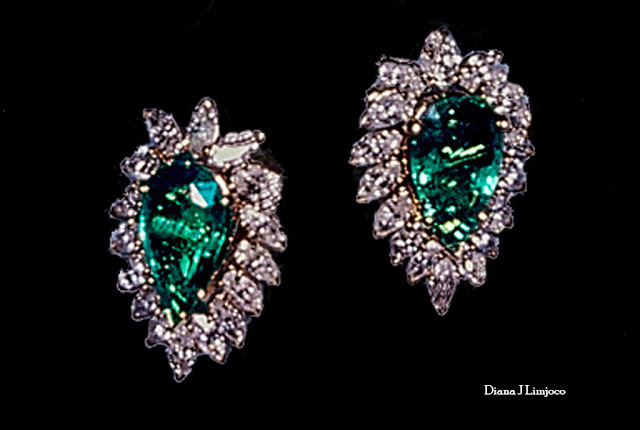 You may see more of them on my original website http://www.djl.net/jewels. I think you will find the pieces truly "Imeldific". 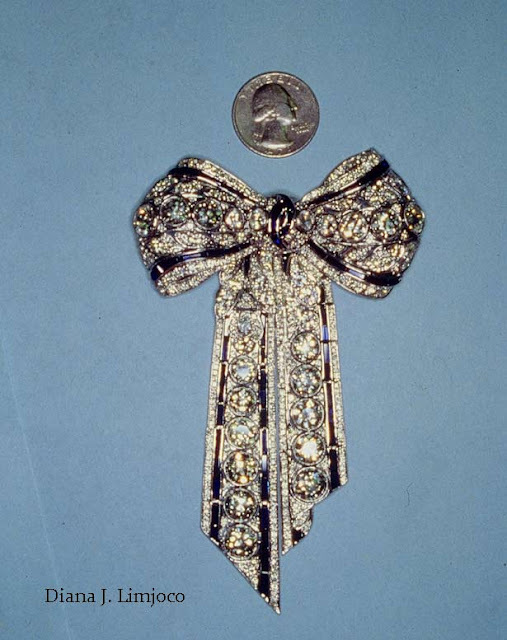 Imelda's Diamond and blue sapphire bow brooch. 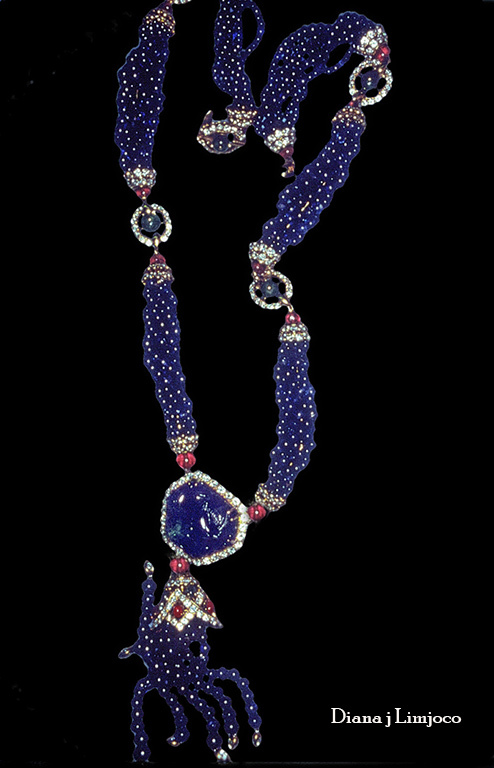 7 carats of sapphires & 46.5.cts. diamonds total. Item #35 on Bureau of Customs list supplied to us to work from. Circumstances were less than ideal. 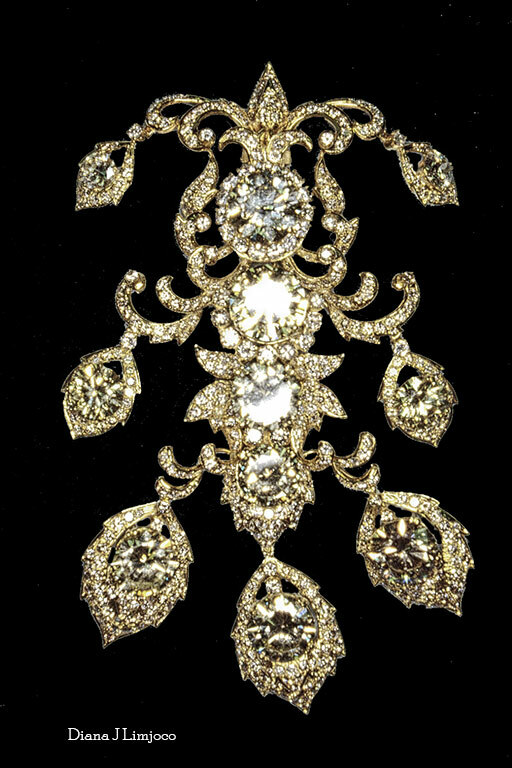 I could not handle the jewels myself. They wouldn't let me use a backdrop I brought (in case it was a magic cloth that made things disappear). I had to wait for each piece to be brought out and only after it was measured, weighed an examined by the appraiser would they then place it on the ugly table or a light blue sheet of typing paper for me to photograph. A truly tedious assignment that took three days, after which I gave up! I felt I had taken shots of the best anyway, so I bid farewell to the gems. 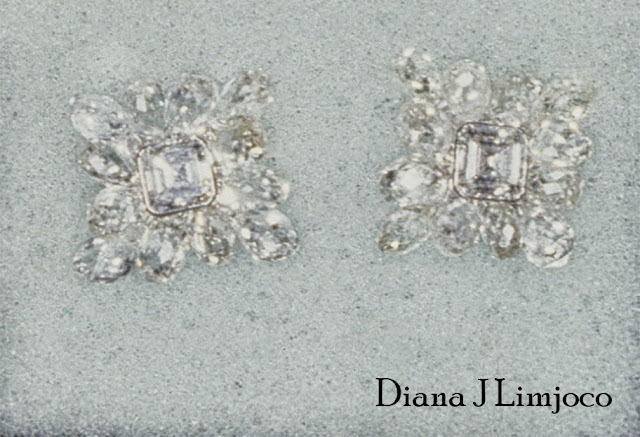 Several pieces in this collection were in need of repair. 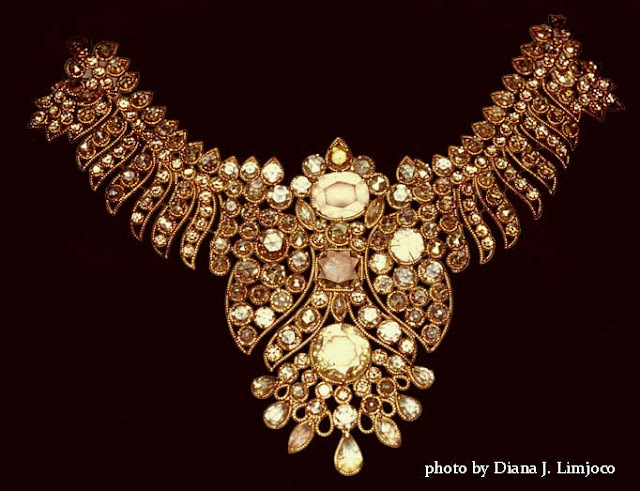 Each piece was removed from a suitcase by ladies from Malacañang, the item was checked off a copy of the list from Bureau of Customs, then handed to the appraisers. Only after they had done their work on them were they handed to me. 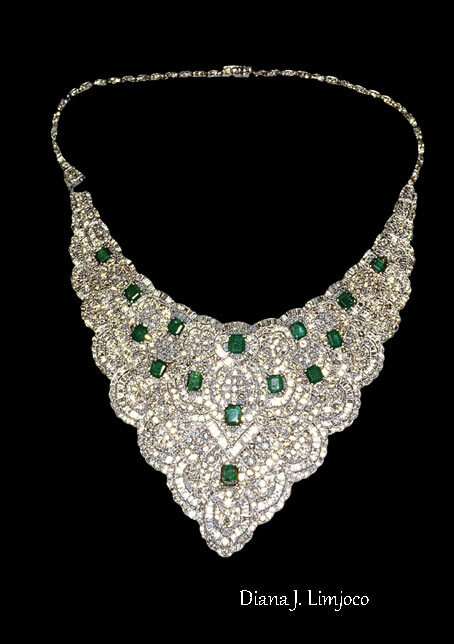 Diamond necklace by Buccellati- 93 carats . 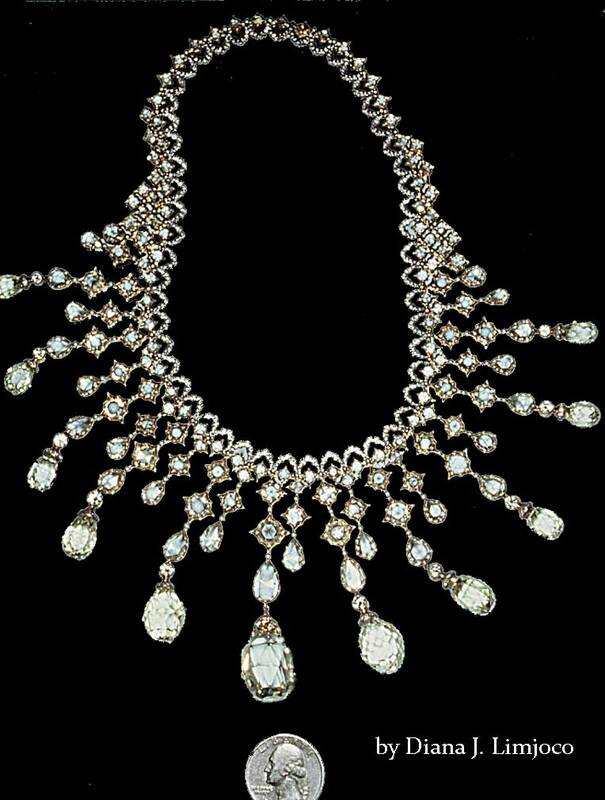 Diamond necklace by Italian designer Buccellati. 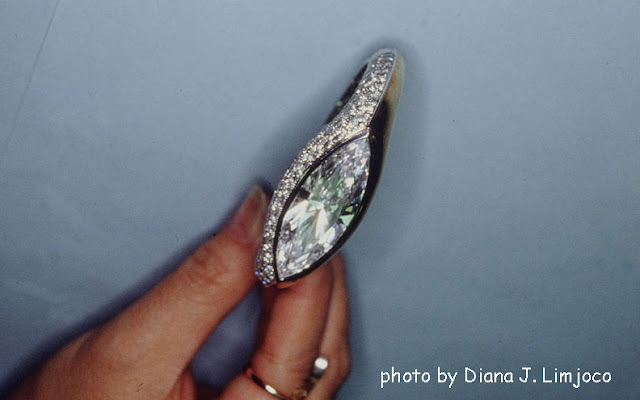 93 cts diamonds. Center diamond above US coin is 15 cts. Item #27b BOC inventory list. 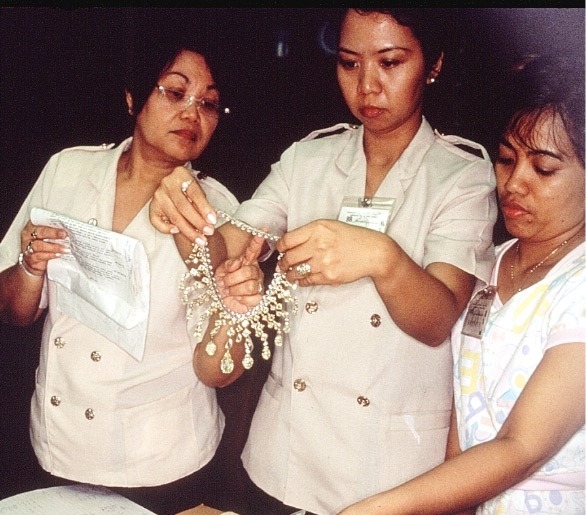 Item 27B- Malacañang staff comparing the Buccellati necklace to the customs list. 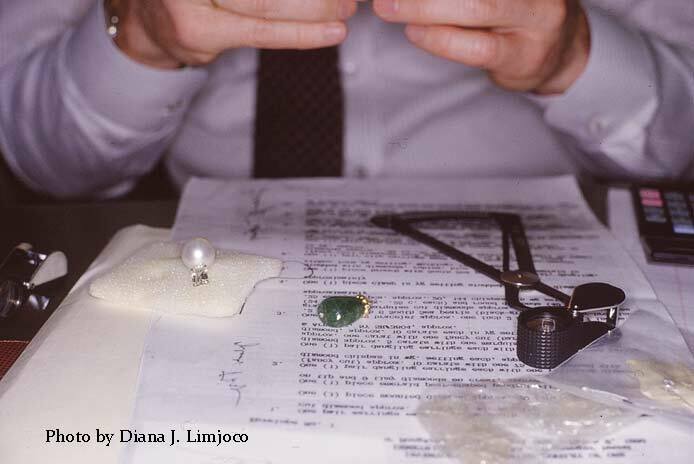 Christie's appraiser measuring one of the stones in a set of diamond earrings. 35 total cts. sea green emeralds, with diamonds. Item#22E PI Customs list. 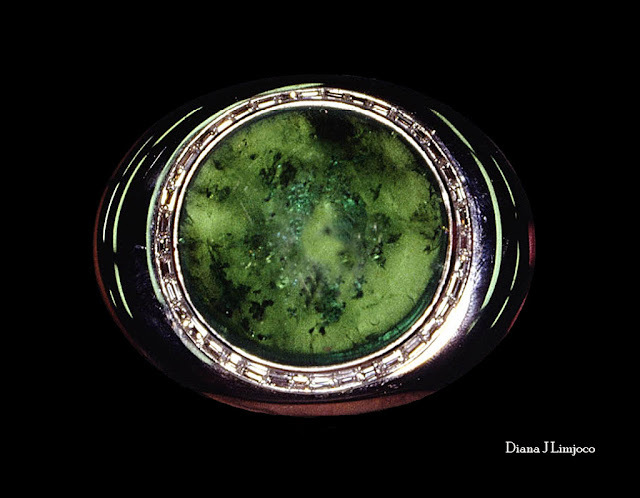 This piece needed a clasp. Item#16-BOC list- The emeralds ( 3 cts. ea.) in these earrings from Van Cleef & Arpels were of such a rare clarity, color and quality that two appraisers from Christie’s could not set a value with out further research. Diamonds droplets 3cts. each. South sea Pearl and diamond bracelet. Brooch is item #25B - Necklace is #25A -Ruby necklace with diamonds, from Van Cleef & Arpels and in center: brooch of raw rubies clusters surrounded by diamonds. This piece was missing a clasp. Item 31 BOC list. Emerald and diamond opera length necklace. 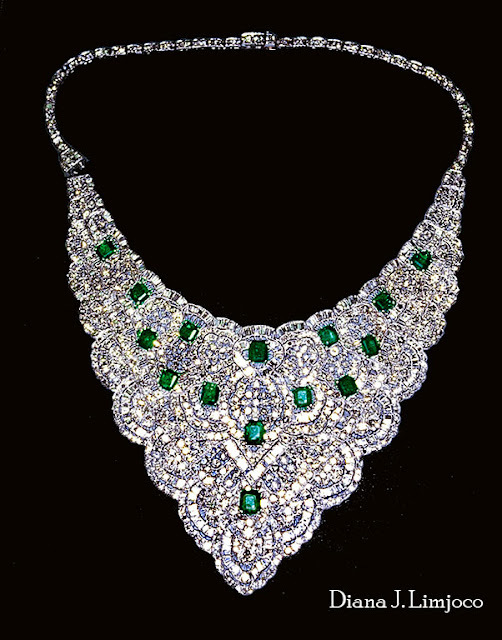 Emerald and diamond bib type necklace. In need of repair as if worn a lot. 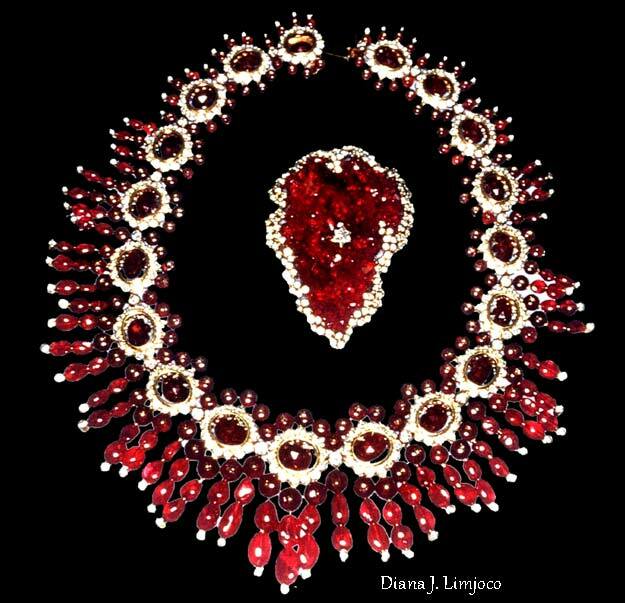 Ruby necklace with diamonds and gold setting. 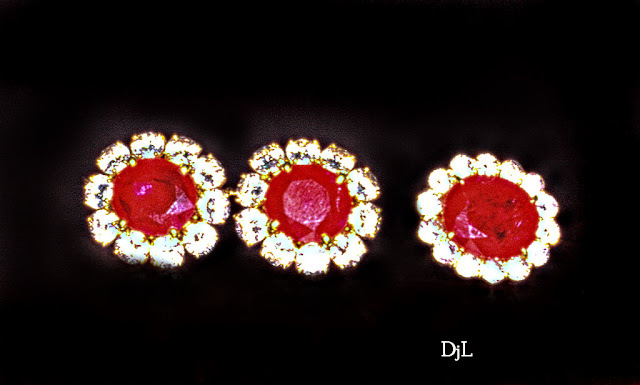 Ruby and diamond earring and ring set. 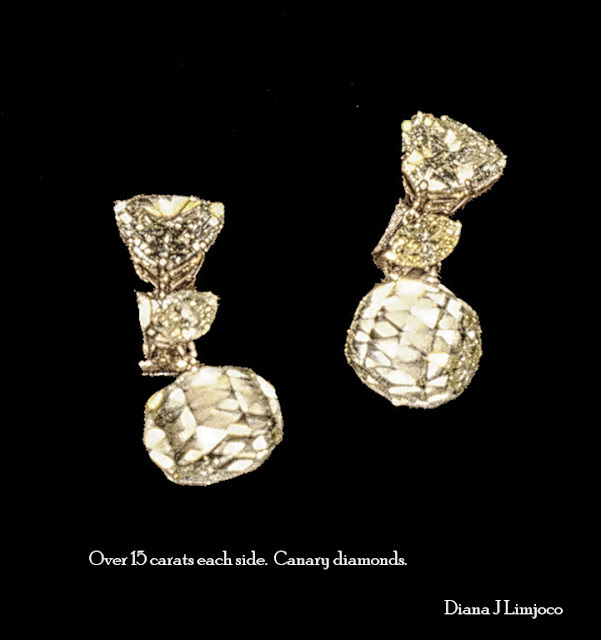 Item#14 BOC list - Yellow diamond is 10 cts. 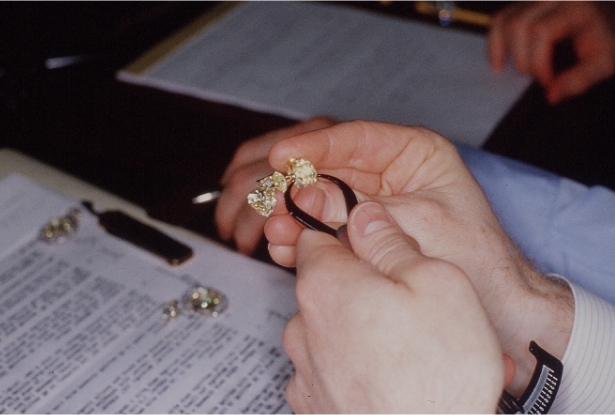 Item #24 BOC list -Estimated at approximately just over 100 carats of yellow (canary) and pinkish diamonds of various shapes, sizes and cuts. 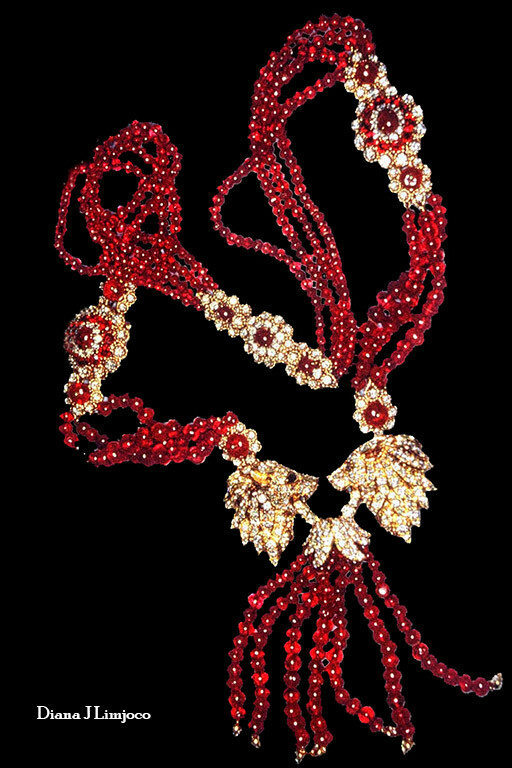 Item# 36- BOC list -Ruby and Diamond bracelet with ten 5 cts. 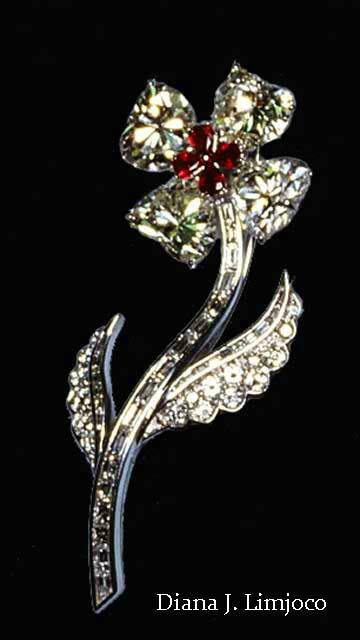 pigeon blood red rubies surrounded by smaller rubies and diamonds in yellow gold. 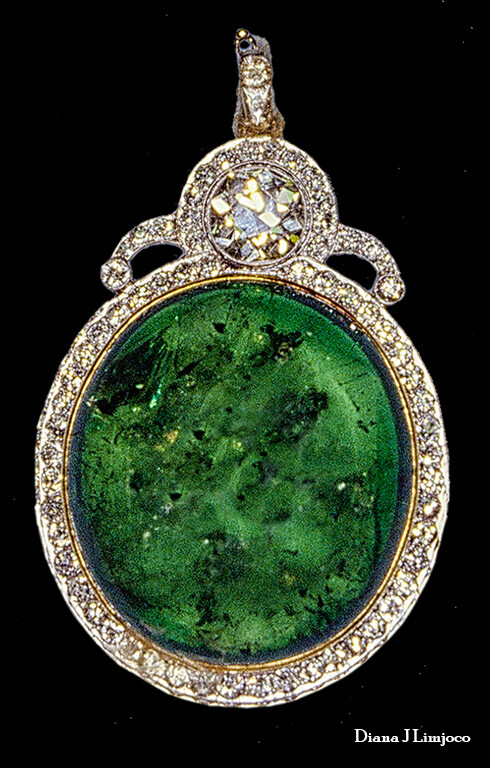 1.5 inches wide X 8” long Marked Van Cleef & Arpels, NY. Item# 36, page 5 PI customs list. In need of repair. Item 30A BOC list. 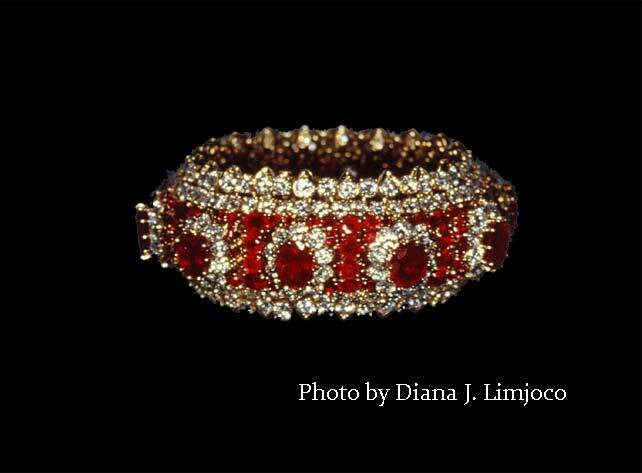 Bracelet from Bulgari, 30.76 cts with a price tag still attached, 1 million USD. 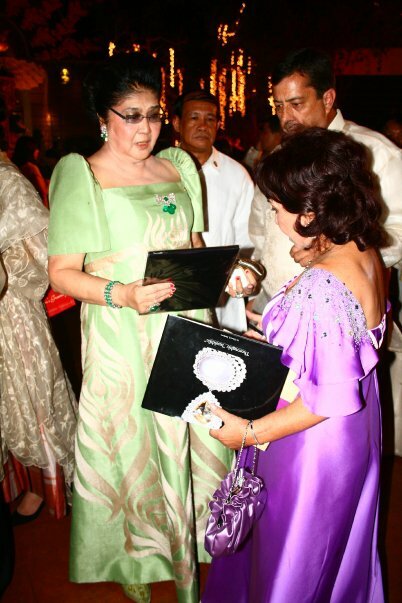 In 2010 with Imelda Marcos. Presenting Imelda with a book I made of photos of her jewelry/ She signed my copy and I signed hers. 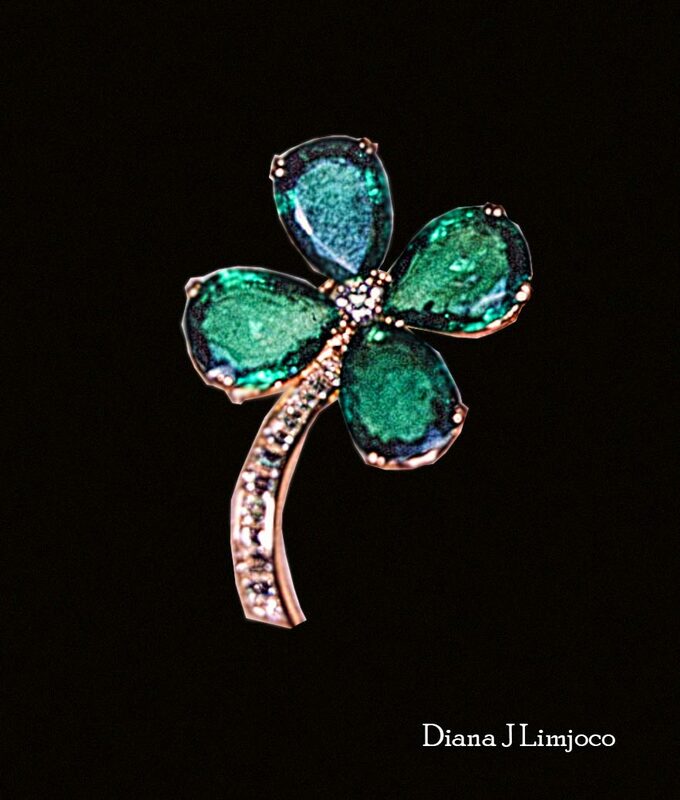 The book is called "Thoroughly Imeldific". 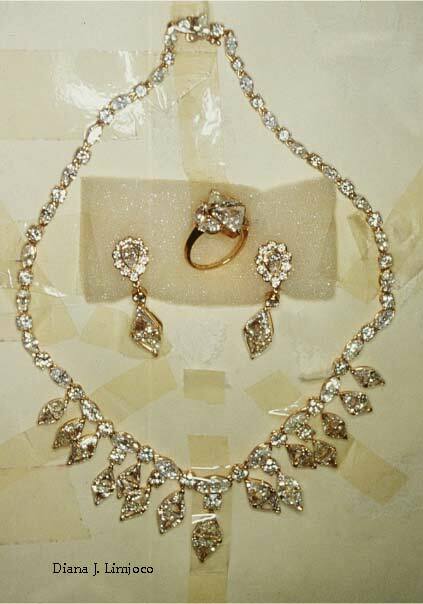 Item 27A- BOC list-The pieces were not housed in beautiful boxes, but taped to paper or in zip lock bags. It was rather sad to see such beautiful pieces come out of zip lock bags. 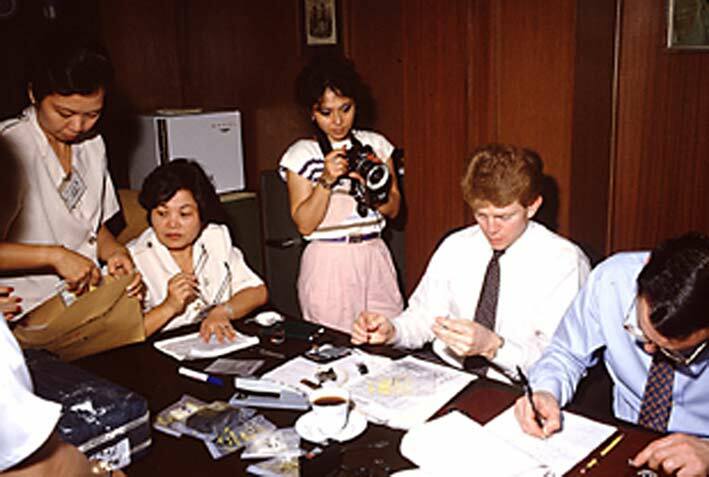 This was me in 1988 at Bangko Sentral de Pilipinas with one of the VP's of Christies. 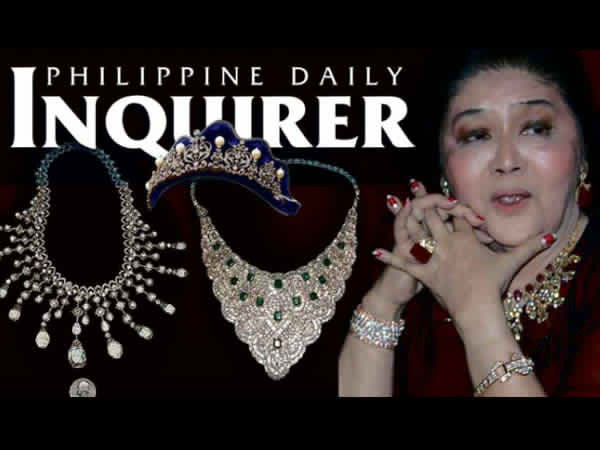 The Philippines said Thursday it planned to soon put on public display jewels seized 26 years ago from former first lady Imelda Marcos, hoping they will be a tourist draw. 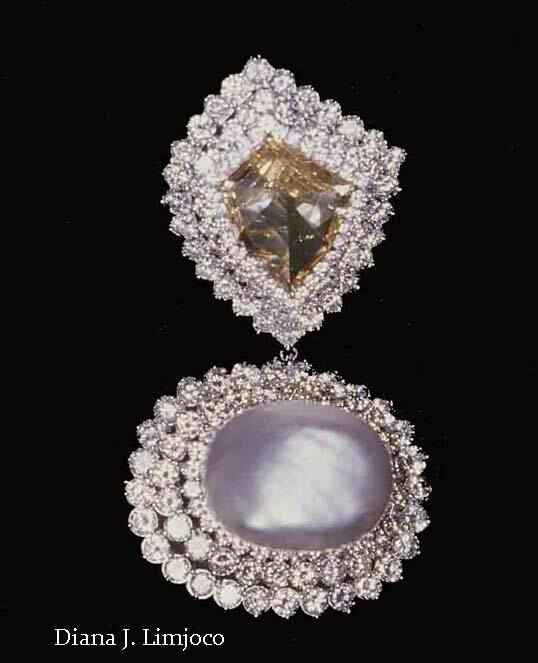 Gov't plans to put Imelda jewels on display. 2 Otters and 2 puppies in a creek! What fun. 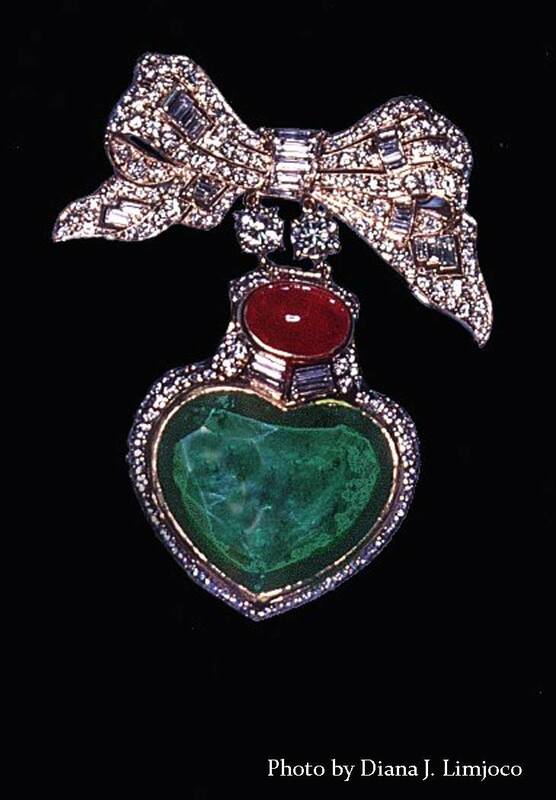 Where are Imelda's jewels now? Photos copyright Diana J. Limjoco - all rights reserved.. Powered by Blogger.